In October 2011, a group of Filipino ministry leaders met for the first time in more than a decade of their ministry existence, to celebrate what will be a “new life” for Filipino ministries in Colorado. The mission was simple: “To pray for the city,” as instructed in Jer...emiah 29:7. 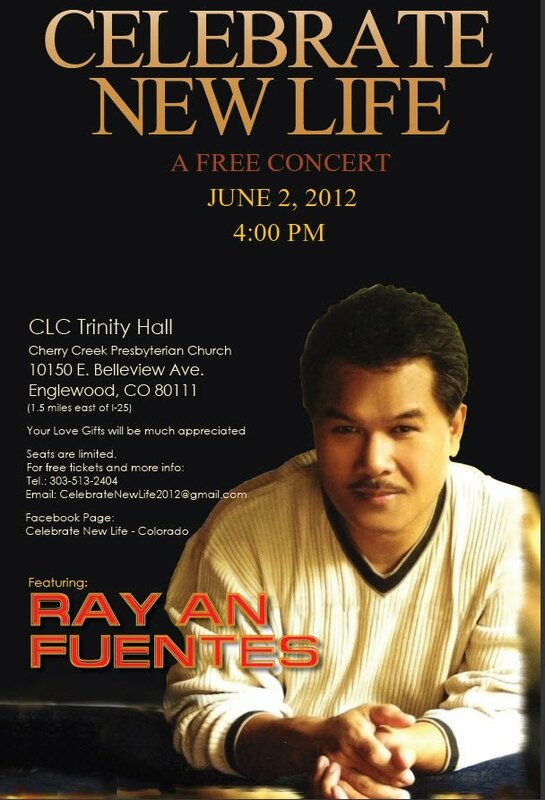 As a celebration of unity, a free outreach concert, “Celebrate New Life” will be held featuring Ray An Fuentes, a Filipino artist in the 80's. Ray An was “graciously arrested” by the Lord in 1986... left Philippine show business at the height of his career and celebrated his new life on Feb. 14, 1988. He has been ministering full time with no regular income, living by faith ever since...and the Lord has proven Himself faithful to sustain him and his family all these years. This exciting event will be held on June 2nd, 2012 at the CLC Trinity Hall of Cherry Creek Presbyterian Church (10150 E. Belleview Avenue, Englewood, CO 80111). The concert will also feature local Filipino artists/bands. Seats are limited. If you confirm in this event, you are guaranteed a ticket. This Oct 7 - 8 @ FACC and Oct 9 - 10 @ Colorado Springs. We know the value of education and I'm sure you remember what your parents usually say "edukasyon lang ang tanging yaman na hindi mananakaw". We are fortunate that our Fil-Am community developed a scholarship program for our children, our future leaders and they need our support in funding this program. We have expressed our support to the Fil-Am community and we would like to partner with you in supporting our organizations scholarship program. How?... to read more, click on the image below or download the file below.